It is like deja vu all over again. Yesterday hawkish Fed saw the dollar rally and then reverse lower. 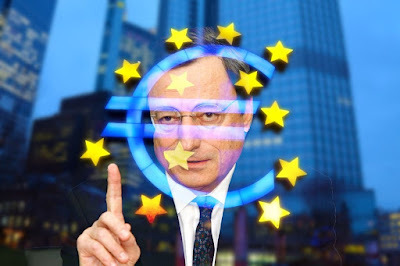 A hawkish ECB saw the euro make a new session high and then turned around and traded below yesterday's lows. The ECB meeting was never live in the sense that it was going to change interest rates, and it did not surprise on this count. The ECB's statement was more detailed and hawkish than expected. It confirmed it would complete its purchases in December. It indicated provided details of the amount it would taper by in Q4. It would taper by cutting the 30 bln a month that is it will purchase through September to 15 bln a month. This means it will purchase 45 bln euros of bonds in Q4. Many had anticipated about 30 bln, but the difference is really inconsequential. The ECB reaffirmed that it will continue to reinvest the proceeds of maturing issues for "an extended period of time." It also gave some clearer sense of the first rate hike by saying that rates will "remain at their present levels at least through the summer of 2019." When a newswire headline claimed this ECB meeting was live last week, the market brought forward the first hike to mid-year from Q4 19. The ECB staff shaved this year's GDP forecast to 2.1% from 2.4% and left the 2019 and 2020 forecasts unchanged at 1.9% and 1.7%. The inflation forecasts were lifted for 2018 to 1.7% from 1.4%. It sees headline CPI at 1.7% in 2019 as well from 2.104. The 2020 forecast was unchanged at 1.7%. The ECB appears to have taken itself out of play by providing some many details and pre-commitments. There was a violent reversal in the euro after it was bid through last week's highs to see $1.1850 for the first time in nearly a month (May 16). A close below yesterday's low near $1.1725 would confirm the potential key reversal. The next key chart point is near $1.1640.